If you've never been before, I really hope you get the chance. 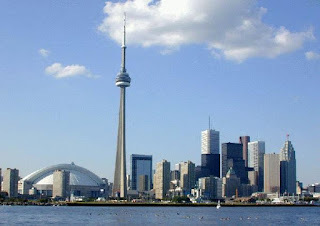 Toronto is a beautiful, clean city with warm, friendly people and a lot to do! I'm fortunate enough to have lived in the area for nearly my whole life, minus the past three years. The summer and fall are my favorite times to visit. The colorful changing leaves or warm breezy days are divine. Ahhhh. This time I'll be staying with a dear friend who has a great apartment overlooking the harborfront. She is in walking distance of almost everything I'll want to do and a subway ride or streetcar away from the rest. Don't let this picture fool you though, the population of Toronto is over 2.5 Million, and the Greater Toronto Area is estimated at over 6 Million! While I will be sans a laptop for the week, I promise to post some fun stuff as soon as I'm back in Florida. So, stay tuned and have an amazing and productive week! I'll be in blogging action again on Sept.2nd. As many of you know, I'm an Interior Designer and I love to transform existing items in my home to make them more customized to our color scheme or overall feel in a room. It's also a great way to create free projects which saves money while reusing and repurposing. 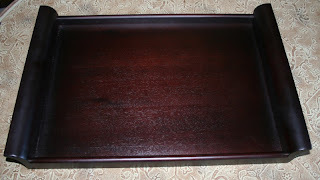 I have a dark espresso color serving tray that we received from my bridal registry a few years ago that has worked well until recently. Now that our new coffee table is the same dark espresso color as the tray, I thought it was time to paint it a lighter color so it would blend in better with the other items and at the same time, stand out. I used some existing Behr paint that we had left over after painting our living room last year, so the tray now matches the wall color which is a great way to introduce a little bit more of the same sand-like color in the form of accessories. I gave it a light sanding and used three coats of latex paint (as I'm out of primer currently) and it turned out great! I was so excited to get started that I forgot to get a before picture of my actual tray. I pulled this one of the web as it looks identical in color and design, so you could get an idea of the transformation. I love quick little weekend projects. I started this last Friday night and it was completely dry and ready to use by Sunday morning. I used a pale blue vase, a set of sand dollars, two books, one dark sand colored, one covered with white wrapping paper as well as a strip of cream and blue damask scrapbook paper. 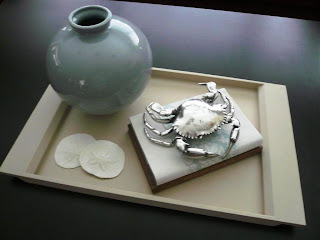 It is topped with a silver crab that I got for a $1 at a garage sale two weeks ago, that Potterybarn sold for $28 last summer! It's the perfect centerpiece for our new coffee table. I was so inspired to paint last weekend that I bought a small white satin tester size paint can this weekend for $2.99 and was able to completely change the look of our bathroom undercounter space with just two coat of paint. It was a light beige color previously and white just looks so much more crisp and clean. It also matches the white framed mirror and some other accessories. 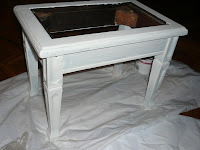 I hope I have inspired you to re-visit your old paint and find something wonderful to transform! My husband and I were getting ready for a double date with another couple last night, so I decided to make sure our car was clean as we were to pick them up. This sparked the topic for today's post. As a Professional Organizer and a bit of a neat freak I have always driven clean cars, both inside and out. For a brief moment yesterday I had a flashback of some cars I have gotten into in the past. I can remember some specific times where I was a passenger inside a colleague's car or carpooling to College with a friend and their vehicles were an utter pigsty! Not only is this a turn off in general but it is not at all classy, or hygienic for that matter. I was amazed that a father of two had loads of McDonald's leftovers and banana peels in the car near where his children sat. My cleaning today was a quick vacuum and ensuring our large umbrella and sunshade were moved to the trunk and off the floor of the backseat, that is the extent of our cleaning because we make it a point to keep our car as close to spotless as we can. For many of you who are trying your best but your children or spouse seem to be the culprit, or maybe you yourself just need a little organizational wisdom, here are some pointers on keeping a cleaner car and having happy passengers. 1. Essentials Only Look inside your glove box, side door compartments, armrest and under the seats too. Spare change, receipts, food wrappers, mail, kids toys, etc., can really start to add up. Instead, remove everything except the important documentation for the car such as owner's manual and insurance, which are to be kept in the glove box. Keep a book of CD's under one seat only if you like to have CD's in the car for yourself or your children. You can keep a first aid/emergency kit in your trunk along with salt and a winter kit for the colder months. All other items that don't belong should be cleared out. 2. Eliminate Junk in the Trunk If you have a tendency to accumulate things in your trunk from sporting goods to shopping bags, get in the habit of removing everything from the car when you get home, that applies to the inside too. This way, things cannot pile up. When you really need the space in your trunk for groceries, Christmas shopping, or an unplanned trip to Ikea, you'll have the room! If you happen to be a soccer coach or absolutely need to house things in your trunk, invest in a couple of clear bins with lids and clearly label them. You can also buy a cargo net for your trunk which will keep items at the front of the trunk area, it also prevents items like grocery bags from rolling all around your trunk..
3. Basic Washing & Vacuuming Apart from the excess items in your car, the basics to keeping a clean car are making sure the exterior is washed as to not ruin good clothing by rubbing up against it when it is dirty. You can wash it yourself, take it to a power washing station for under $5 or if you have a little more cash to spend, take it into a drive-thru car wash where they can also take care of the vacuuming for you too, if you like. Vacuuming is the next step to insure all pebbles, crumbs, hair, dirt, etc are eliminated from upholstery, leather and floor mats. We vacuum houses on a regular basis, a car should be no different. The final touches are ensuring the windows and mirrors are finger-print free, wiping down all other areas such as the dash, steering wheel, console area, handles, etc. In addition, if you use rubber mats on top of or in lieu of the cloth mats, do wash these with soap and water to remove dirt, salt stains in winter, etc. All of these tips will help keep things clean, and germ free. 4. How to Handle Trash-Trash as with all other miscellaneous items should leave your car every time you get out of the car, no matter where you are. Everyone is responsible for their own mess including children, who are responsible for their own stuff at the age of 4 and up. If children take ownership of their own mess at an early age, you'll have far less to clean up in your car and in your home. If you stop to pump gas, buy a coffee, or head to a store, throw out any drink containers, junk mail, wrappers, tissues, etc. When you get home you can offload the other items so your car always stays pristine. 5. Get Organized with Containers-It's one thing to get things organized one time and another to maintain it. A system needs to be created to make things easy to keep it neat. Sometimes the mess in our car is due to the need of certain items that don't really have a 'home'. A pair of soccer cleats you need three times per week for soccer, books that are being returned to the library, jumper cables, and more. The best thing to do is invest in a few plastic tote bins and label them or better yet, buy clear plastic so you can see what's inside. One can be used for car-specific items such as the aforementioned jumper cables, extra windshield washer fluid, a roll of paper towels, cleaning wipes for on the go messes and more. Another bin for emergency items such as a first aid kit, flashlight, a few spare bottles of water, snacks such as energy bars and yet another one can be created for items to be returned like library books, a toy or household item that was borrowed or a place to store a bag of Goodwill items, etc. This way, you stay organized and it frees up the usable seating space in your vehicle and keeps it from becoming cluttered. If your groceries are placed in the trunk, to keep them from rolling all over the place, invest in a cargo net. Nobody I know has time to vacuum or clean their car every single day, but if you can plan to keep on top of washing and vacuuming once to twice per month, your car will always look pristine and ready to welcome guests. You'll feel so much better about your car as you've taken pride in it, regardless of what you happen to drive and the side bonus is that it helps protect the value of your vehicle as well as your paint job as it will be less prone to rusting in winter slush and salty beach air. I'd love to know, what are you tips and tricks for keeping a clean car all the time? I was inspired to do a little shopping today after receiving a JC Penney coupon in our weekly circular. It is essentially a $10 gift card as long as you purchase that amount or higher. There were some brief restrictions including fragrances, cosmetics, etc., but I wasn't going to pass this one up! I've used these coupons from them two other times, one time I purchased clothing and the last time it was jewelry. I am on a budget at the moment as I am planning my next trip to visit my family and friends back home, so I'm quick to find sales for things I need. I also try to stay out of stores in general if I know that I'll find things that I can't afford to be spending money on at the moment. Hence, today's sale shopping. Classy women don't spend money that they don't have. It is especially important in these economic conditions to be responsible and in control of our finances. That doesn't mean however, that we can't enjoy some fabulous finds at steep discounts along the way. The key is to master the art of using coupons, taking advantage of sales and clearances and remembering to bring those saved up gift cards to the store with us. That is why I'll be releasing a second book in early 2010 that will specifically focus on saving money without sacrificing the style you crave. It is a must read for anyone who dreams of the champagne lifestyle, but on a tap water budget. More to come on that later. As an example of the types of sales I typically frequent, I wanted to show you what I got with my coupon today. I always try to stay as close to that $10 price point as possible so I can capitalize on the savings and only wind up paying tax. 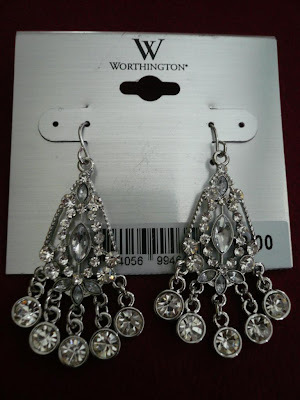 Luckily for me, there was a 30% off jewelry sale today too, so I got to use both the sale and the coupon! Don't let my mediocre photos fool you, these sparkle and shine! I love them and can't wait to wear them soon. I can dress up a semi-casual look for evening or wear them with a cocktail dress. Look out for JC Penney flyers that contain these coupons, they run this offer several times per year, especially during the holiday season. I love sharing money-saving ideas and tips with others. Do you have any great deals you recently snagged or special sale tips? Feel free to share them! Whether you've been invited to stay the weekend with some friends or invited to a holiday feast, lovely dinner party or BBQ, it's always important to bring something thoughtful for the host or hostess. As I mentioned in a previous post, it is polite to send a thank you card to the host after the event to both thank them for the invitation and to share what a great time you had with everyone (provided you actually did). Particularly while being invited to either an intimate dinner, a holiday gathering or a dinner party, you'll want to bring a little something with you for your hard-working host. Try to select something that is practical and can be used or shared during the party itself. 1. Dessert Wine- This is a great option for sophisticated wine lovers. 2. Gourmet Chocolates-I don't know anyone who doesn't appreciate quality chocolate! 4. A box of specialty tea such as those individually packaged in little triangles or loose tea. 5. A couple of packages of fun napkins in a gift bag, or those with the family's monogram. 6. Wine charms-These help separate identical glasses so the guests will know which is theirs. 7. A Pet Gift- If you are close to the host/hostess and their pet is like a child to them, bring them a treat for their pet or something specific like a fun yet inexpensive new dog collar. 8. Dish Soap/Hand Lotion-These are practical and will get used. The ones in the photo above are from MarthaStewart.com. Other great sets can be found at Williams Sonoma or any major discount retailer. 9. Beautiful Napkin Set- Bring a set of 4-6 cloth napkins (depending on the size of their family). 10. DIY Crafty Gifts- If you're talented in the craft department and you know the host really well, do bring your own creation- a wreath, some homemade goodies, homemade herbed vinegars, etc. These gifts do not have to cost a fortune. In fact, I keep a couple large gift boxes in a spare closet that house smaller items that I've found all year round. These items can be found during sales or clearances where they're worth $20 but you've paid less than $5 and you'll leave an impression. This also makes birthday, Christmas and hostess gifts a breeze. I also stock up on lots of thank you and other note cards that I've picked up on sale as well as stamps so I can send off a note in no time. If you have been invited to a potluck and were asked to bring a specific item, in this case you've done your duty. Anything extra after that point is just strictly up to your own discretion but is not at all required as you are helping the host create her menu. 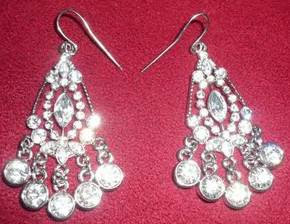 Here is a link to some great hostess gifts at ApartmentTherapy.com. Check them out! If you have some great host/hostess gift ideas I'd love to hear them! 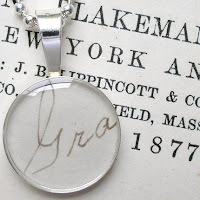 Have you ever wondered how to create a signature for your BLOGGER blog posts? 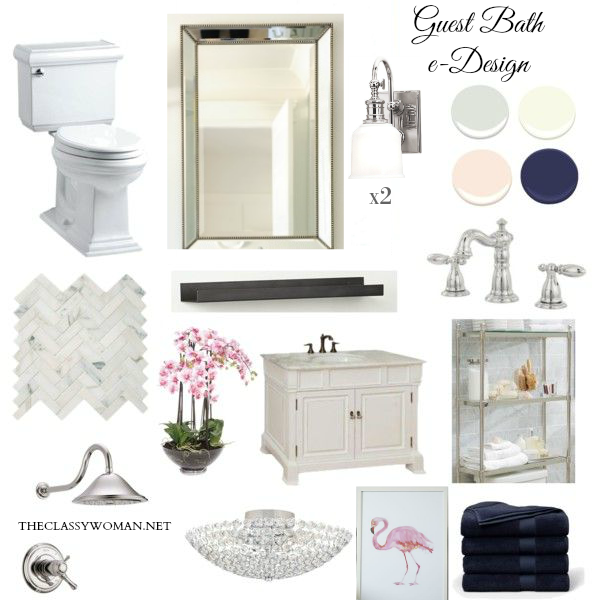 It's so wonderful to create a customized look to make it feel more like your own. Classy women share great ideas and tips with others so that they too can be successful. So, in the spirit of sharing I'm going to provide this link to 'Mom's Who Blog' so you too can get the instruction to create your own. It will take about 15 minutes. It took me longer because I somehow made it complicated for myself. When I didn't automatically see my signature on my existing posts, I thought I had done something wrong. In actual fact, when you add a signature it will only show up at the end of all of your new blog posts going forward. The great thing is My Live Signature is an easy tool to actually create your signature with loads of fonts to choose from, the size and even an option for a slanted signature. Once yours is complete I highly encourage you to copy and paste the HTML text into a word document that you can store in a computer file. This will be used for your post signatures. If you had always wanted a great signature for your email, they'll give you an option for that as well via various email programs including Hotmail, Yahoo, etc. It wouldn't be fair if I only TOLD you about my office chair and that you couldn't SEE it for yourself. 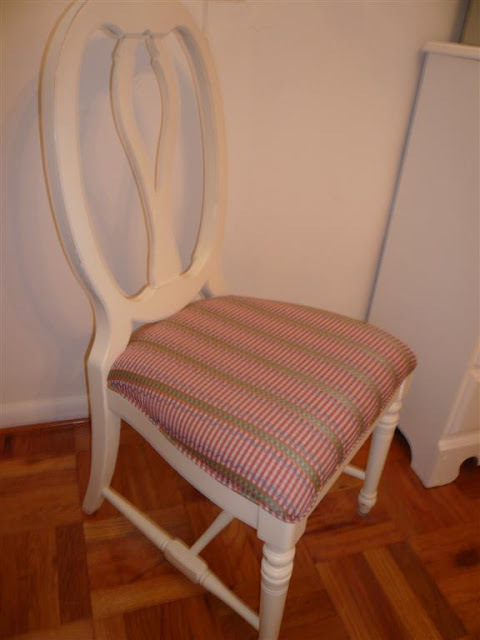 I used the remnants of my fabric from this office chair transformation to complete the look of my vintage footstool, so it was very economical. Above is the finished set! 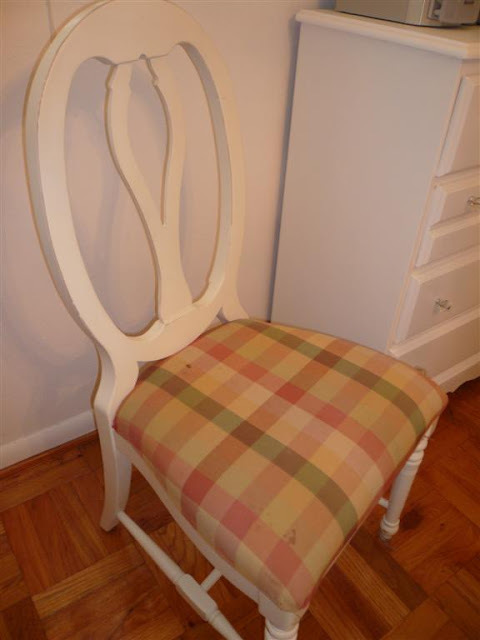 The first photo is how I purchased the chair, then underneath the plaid was another layer of colorful fabric (which came with the chair when it was purchased by the original owner). It was very clean but did not match my decor. I wanted something in a transitional style fabric. This was very simple to do. I measured out the fabric so there was about 3 inches all the way around an then started stapling each side from the middle towards the edges. 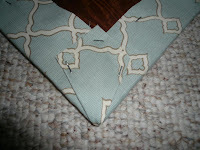 Don't get too close to the edges though so you can create a little triangle to pull the corner fabric in. This will ensure that the corners look clean vs. bunched up. I'm very pleased with my new chair! Do you have a makeover that you are proud of? Share the link to your site/blog with us in the comments below! 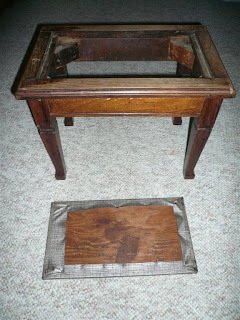 As I mentioned in Saturday's post, I have been working on a little footstool transformation. 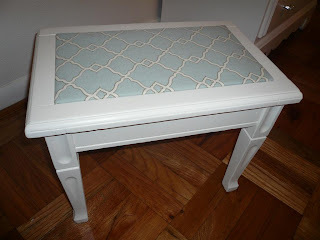 I took a vintage footstool that looked far too warn for our decor and revamped it! 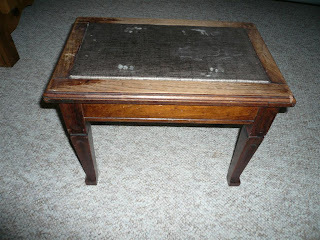 This footstool was handmade by my hubby's grandfather many years ago. While he is no longer with us, his memory will live on and my husband was thrilled to see that I was updating it so it could be used in our home. It will live in our guest bedroom/my office where it will be used to rest my feet and ease my back while working on my laptop. It can also double as a short stool in a pinch for extra seating too. The above photo is the finished product. The leather was covered over with new fabric by simply using a staple gun and new fabric and here it has one of its three coats of Olympic's 'Ivory Tower' so it will match the fabric. Below, I've shown how to tackle corners by tucking so that the all of the fabric lays flat. I apologize for the awkward photo placement as blogger isn't always the easiest to maneuvre the photos. I'd love to see what projects you've tackled. Take a moment and post a comment with a link to your blog! 1. Paint it Pretty!-If you've got several pieces of furniture in a room that lack a cohesive feel or are just plain outdated, a quick coat of paint will give them new life. If you want to take it one step further you can replace the drawer pulls or knobs with something more contemporary or whatever the style you desire. You're pretty much guaranteed to get a winner if you stick to classic colors like black or white. You'll want to sand the piece lightly first to remove any varnish and to rough it up so the paint adheres better. If you want something fun for a kids room or something a little more coastal, some beachy blues make for lovely coffee tables, nightstands or even a bed! You can use leftover paint you may already have, find some on craigslist or invest in a small quart-size can. Be sure you get the finish that you want. 2. Frames are Fun!-One great thing you can do is round up a bunch of old frames you no longer use and create a wall collage. Pick one place in your home where all photos can be displayed vs. having random photos all over the place. It looks more substantial on one wall and a great way to cover a wall. You can use what you have or pick up what you need at a yard sale or flea market for anywhere from 10 cents to $1.00. Round up all the various mis-matched frames and sand them and then spray paint them all black. To create uniformity, take the photos you have and scan them into your computer where you can print all of them in black and white or if you have them on file, simply print in black and white. There are loads of free programs online that will change a color photo to black and white or sepia, such as http://www.resizr.com/, which will also let you resize and crop them too. Put them in the frames and arrange them in a neat pattern on your wall. 3. Paper or Photo?- When it comes to what you put inside your frame, you are not limited to just photos. You can create lovely framed works of art by simply picking up some gorgeous scrapbooking paper or fabric from the clearance section of your local craft or fabric store. I've had a white matted Ikea frame for about 10 years and it is in mint condition. It was hiding in my closet since I had no use for it. I found a space above the doorway to my kitchen that lacked art. I replaced the photos I once had with some beautiful scrapbook paper. The frame is rectangular and has spaces for (3) 5x7" photos so I placed a subtle striped lemongrass colored paper in the middle and on either side I have a beautiful damask/floral that has a lovely shimmer too. This project was FREE as I had all the materials already. 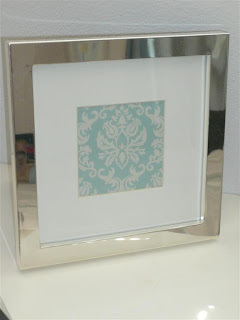 I was then inspired to add another one to a shiny chrome-looking square frame which now houses a pretty pale blue and cream damask printed scrapbook paper. 4. Custom Creations- I spend most of my days as a designer, creating spaces for other people. Many of these spaces include a lot of custom pieces such as upholstered chairs, drapery and the like. In January 2008 I decided I was going to make more of an effort in my own home to take the time to create some custom pieces. One of my favorites is my office chair. I bought it from Craigslist in great condition but it had one flaw-the fabric on the seat was hideous! It needed to be reupholstered. Lucky for me, I was actually looking for a chair that I could make my own. So, I headed to Calico Corners and happened to stumble across a fabric I'd been eyeing for about a month-it was on sale! I wound up getting half of a yard for just $4 and the chair in mint condition cost me $30 so I got a custom office chair for just $34! You can do this too. 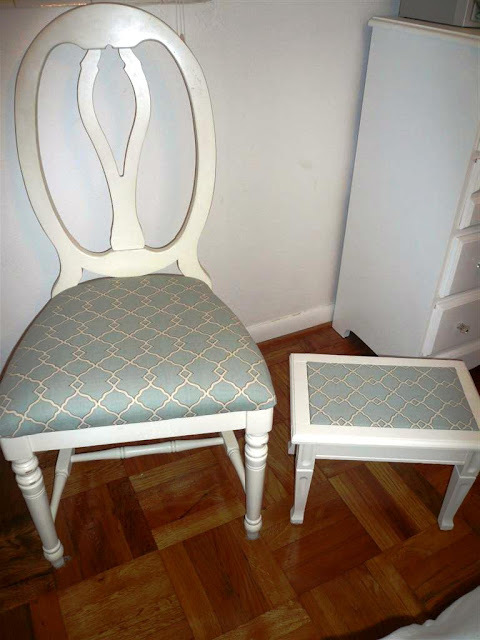 If you're new to it, start with smaller pieces like simply re-upholstering the seats of dining chairs. 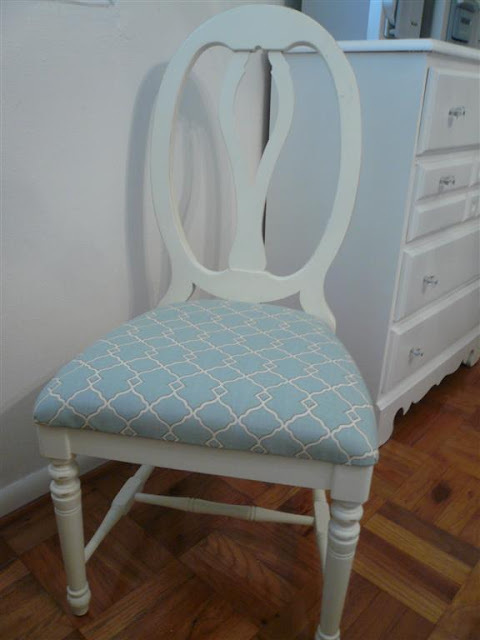 If you want the look but are afraid to tackle it yourself, take your materials to a local reupholstry shop. Custom drapery, ottomans, recovering of a sofa, and throw pillows are all within reach! 5. Odds and Ends-Sometimes we purchase some great things but we tire of them so we switch them up with other, newer decor items. Other times we've purchased something or got an amazing deal but aren't sure what to do with it just yet. I encourage you to pull those things out of the closet, basement, attic (wherever they are!) and use them to update your space. For instance, I purchased a beige linen drape (just one) that came from Goodwill brand new (the Target locally donates a LOT of surplus items so I love shopping there!) for just $6. I intended to use it for the guest room as more of a sheer behind the existing set of drapery panels only it didn't match the way I thought it would. I wondered what else I could use it for. Then it hit me-our laundry room has a rollershade but it's the vinyl type (we do not have a glamorous laundry room yet!) so it was a great way to put it to use. I hung the panel with a short black rod that I had bought for our kitchen window but never got around to using. Voila! Instant beautified window treatment! 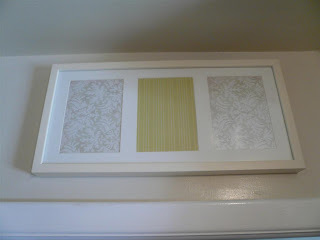 Later I may use a damask pattern stencil and some white paint to jazz it up further! Just be creative-think of all the vases and flowerpots you have and how you can use them different of freshening your kitchen with some existing new placemats or a runner. Maybe all you need is a few new toss pillows for your bed to complete the look. They are relatively inexpensive at discount stores and are relatively simple to make. Use existing down-filled or poly-filled inserts from older pillows you don't use and let that be the stuffing. Now have some fun and pick up a small piece of some inexpensive fabric and a zipper! Use what you have. No vase filler? Use coffee beans, lentils or white rice inside a glass hurricane and place a candle for some coffee table appeal. Keep your lamp base and simply spray paint it for a new look, or maybe just replace the shades with a pair of inexpensive new ones. If you live in the Orlando or Central Florida area and would like advice or other design services, you can contact us by visiting our website. 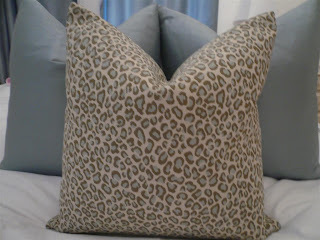 *In case you were wondering, the cheetah print pillow in the photo is one that I created with an invisible zipper sewn in and used an existing unused down-filled pillow insert to complete our guest bedding. 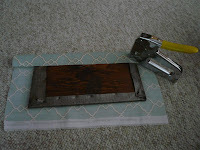 Stay tuned on Monday for my before and after reaveal of a little vintage footstool I'm tranforming! It just occurred to me that other than my bio, you probably don't know a whole lot about me. I thought I'd share ten things about myself that you probably didn't know. I'd love to hear from you too so feel free to write a comment with some of your own! 1. I'm half Dutch and half Polish. My maiden name was hard for most to both spell and pronounce so thankfully hubby rescued me now that I'm a 'Davis', however I do miss the uniqueness of 'Ruzycki' pronounced 'Roo-zick-ee'. I think it's funny that in Canada a 'z' is a zed and in the U.S. a 'z' is a zee. 2. My husband and I met online at http://www.christiancafe.com/. He lived here in Florida and I in Toronto, Canada. We dated briefly and he proposed in front of the Eiffel tower 3 months later! Less than 4 months after that we were married. It was quite a whirlwind! Some say it was too soon or it was a crazy thing to do, but we knew we were meant to be together. 3. I'm a dessert-a-holic. I wish it was a food group. I basically work out so I can eat dessert! 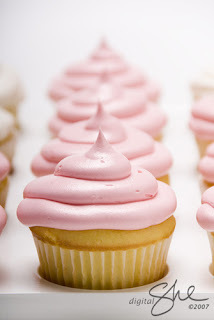 I love lemon bars, lemon tarts, creme brulee, gelato and at the top of the list is CUPCAKES in almost any flavor! I also adore tart yogurt. A local shop called Sweet is my favorite go-to place. 4. I LOVE to travel and have now seen 15 countries. I'm still trying to catch up to my hubby though, he's seen 55 countries and 6 continents, I guess you could say I married to a bit of a world traveller. 5. I have to create at least one thing per day or I don't feel that my day is complete. It can be writing an article, creating some artwork, completing a scrapbook page or even starting a new garden. I prefer it to be something crafty that I make with my own two hands. 6. I am in love with organizing and storage containers and love to keep things clutter-free. I started my Design business several years ago as a Professional Organizing company and now specialize in Design and Home Staging. From the age of five my Barbie house was turned into a book shelf and everything in my room was always immaculate, complete with made bed. It's no different today. Ironically, I married a disorganized man who loves to hold on to clutter, so I work doubletime trying to keep our house in ship shape. 7. I don't have any children yet but have always dreamed of having two girls first then a boy. My brother is 11 years younger than me and I was his constant babysitter and second mother so I'm ready for pink, polka dots, ruffles and everything girly. I am not pregnant right now but I've already started my little girl clothing collection. 8. My dream home is a beach house decorated in a casual and cozy yet sophisticated style which I like to refer to as Beach House Glam. I love whites, creams, pale blues and soft sand. However, with so many great locations, I'm not sure exactly where I would to live just yet. 9. I heart our planet. I've been composting since age ten and recycling for as long as I can remember. I love finding new ways to become more eco-friendly as well as reduce, reuse and re-purpose what I already own. I will have a green book available in 2010 and I even started a green blog so feel free to check it out! 10. One of my favorite snacks needs to be imported from Canada: Lay's Dill pickle potato chips. I love them to pieces and was thrilled when one of my best friends, Charlotte, sent them in a birthday care package last August. Second in line would be ketchup chips. This is the norm for flavors in Canada so I was sad when my chip selections were dramatically reduced upon moving to America. Having said that, I don't eat a lot of chips, but when I do, I really enjoy the tangy taste of dill pickle. I'd love to hear from you! Tell us about yourself. What do you love to do in your spare time? Where are you from? Do you have any fun quirks you want to share with us? Travel Tips Part 2: Don't leave home without it! The old slogan remains true-don't leave home without your American Express or whichever credit card of choice you possess. By the way, that wasn't supposed to rhyme. LOL. Beyond the plastic, here is a list of items you won't want to travel without! Before I leave for any trip I ALWAYS write out a list of what I'll want to bring (maybe a little Type A but hey that's me, I like to be prepared). I usually start it about a week before I leave so I can edit it or add to it and make a quick run to a store if necessary. Remember, anything will almost always be cheaper in your home country so buy it before you depart. 1. 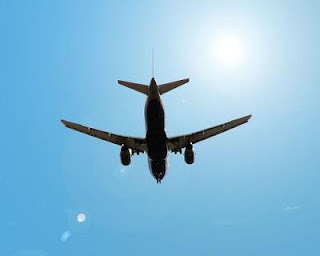 Passport-If you haven't travelled in a while, I'll fill you in-you need a passport to travel now when leaving the U.S. Before it used to be that you could carry your driver's license and birth certificate. That is no longer in effect as of this year. 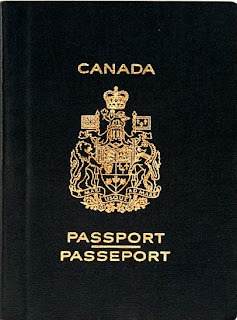 Make sure before you travel you give yourself enough time to go an apply for your passport along with get a photo made. In most cases it can be expedited for a fee if you're really pressed for time. Also, if you haven't travelled in a few years, check the expiry and make sure yours is still valid-don't assume. 2. Camera, Batteries & Memory Cards-Sometimes the most obvious things to pack are the ones that somehow slip our minds. This happens to me all the time at the grocery store, that's why lists are so important. If your camera takes rechargeables or has a battery charger-bring it with you! You can always buy disposable batteries if needed but the rechargeables are cheaper in the longrun and of course better for the environment too. :) This all applies to your video camera too. Be sure to bring extra tapes or memory cards. This past trip I brought nearly 3GB of memory card storage and it wasn't enough. The prices in Europe were horrific so I deleted a few not-so-important ones to accommodate. It's always better to have too much than not enough when it comes to precious travel memories. 3. Sunscreen and Aloe- With summer here bring a high SPF sunscreen with both UVA and UVB protection, and be sure to also pack some aloe too in case you do happen to get a little more pink than you had hoped for. This will save you shopping time and likely extra cash. By the way most people only use a sunscreen with UVA protection which means you may be reducing your chances of a burn but increasing your chances of photo-aging which means dark spots, fine lines and wrinkles. It's a good idea to use a waterproof sunscreen even if you're just touring a city-in really warm climates you'll sweat and it will wear off quicker, be prepared. 4. Money-Once again this may seem obvious but a lot of people solely rely on credit cards. If any type of emergency or unexpected expense were to occur, you want to be prepared. Also, a lot of places only accept cash. ie: subways, streetcars, street/shop vendors, tips for bellboys and cabdrivers, taxis, etc. Just be sure to have it tucked away safely-a waist belt is a good idea when travelling in foreign countries. I just came back from Rome where two people I spoke to had friends there that were pick-pocketed-No fun! 5. Cell Phone-While it could become costly to make calls out of your home country due to roaming charges, in some cases it could be a life saver as an emergency tool. Be sure to check the rates and inquire about all charges that would apply before leaving so there aren't any surprises. 6. Voltage Converter/Plug Adapter-These only apply if you are travelling outside of North America. If you are planning a trip to Asia, Europe, etc., you'll want to pick up a set of these. Other countries operate on other voltages and the converter will make sure your electric gadgets will work. Also, different plugs are uses so the outlets are different and your hairdryer, cell phone charger etc will not work unless you use these devices. A good set containing everything can be found for around $15. Cruise ships are generally the only exception. On my last cruise I discovered that they had outlets that catered to European and North American travellers. 7. Maps/Travel Guide Books-Many times if you are staying in a nice hotel they'll provide you with a map. It's always a good idea to pack one of those beforehand if you can. That way you can plot out what you'd like to see beforehand. I like to check out travel guides from the library to cut costs when travelling abroad. I was able to score one for every country we were travelling to. They usually have great advice on hotels, restaurants, shopping and what to see. 8. Comfortable Shoes-I'm a girly girl at heart and I LOVE cute shoes, especially pumps but they are not at all practical for travel other than a fancy dinner so I pack a lot of flats and a pair of running shoes for the gym. You'll want to have a few different choices. Flip flops are great for the beach and a casual walk, but not for an all-day hike, excursion or tour of a city. Your toes are forced to hold the shoes on and you can get pains in your shins-not worth it! I highly recommend some cushy ballet flats, walking shoes or running shoes and a pair of water shoes if needed like some cute slingback, ballet flat crocs. I hated crocs until I found these. It's not fun to get blisters halfway through your vacation. You can glam it up for a special event or a fancy dinner. 9. Vitamins/Prescription Meds-If you take medication or herbs and vitamins, don't forget to pack those as they'll be essential to how you feel while away. Many people ditch their multi and it is the precise time you'll want more energy as jet setting can be fun, but exhausting too. 10. Bathroom Stuff- Okay, so I called it bathroom stuff because this encompasses not only toiletries but also small appliances and female products. I made the mistake of not bringing my own female products on my honeymoon as I shouldn't have needed them but realized later I calculated wrong and did in fact need them! We were in Fiji at the time and I was stuck with buying tampons there that were uncomfortable and I was frustrated. It put a bit of a damper on things.Bring your own! I don't know about you but I am not a fan of hotel shampoo, it leaves my hair feeling sticky and dry. If you're like me do pack your own 3oz sizes of shampoo, conditioner, body wash and don't forget your razor, toothpaste/brush, hair brushes and of course your own mini dryer and curling iron if need be. I'm not suggesting you should be a diva and pack loads of stuff but rather mini versions. I like using a curling iron for formal occasions and my hairdryer is tiny and light enough to not be a problem. I've been to hotels before where the dryer didn't work, it's nice to be prepared and have your own! Here is an awesome packing tool that you can use to determine exactly what you need for your trip and it will even e-mail you the list! By the way, if you missed my post on packing a carry-on bag-here is the link to Travel Tips: Part 1.